These taste sensations will make your next tailgate party the tastiest ever! Tried-and-true recipes for delicious treats will turn heads and delight your guests. You’ll be dancing in the end zone once your family and friends try these kicked-up dishes! 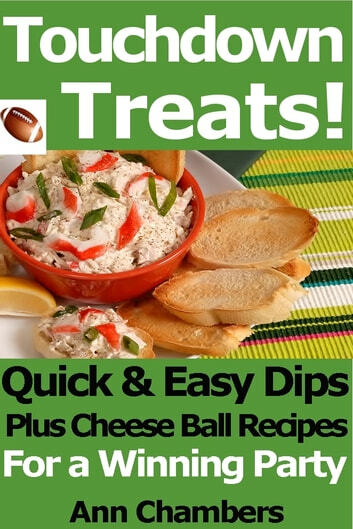 Perfect for game day or other occasions when you need appetizers -- like Thanksgiving, Christmas parties, New Year’s Eve, Super Bowl parties, or even birthday parties. Don’t be caught off sides with a boring old green bean casserole ever again. Dips are a standard offering at any casual party because they are easy to prepare, fun and delicious to eat, and they can be easily expanded to serve any number of people. 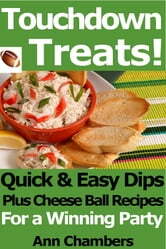 Unfortunately, there are a handful of acceptable but not fabulous dips that are standards at most parties. These recipes will explode your dip choices with fun and fantastic new choices. Spice up your menu with these new ideas. This book doesn’t contain every single dip ever invented, making you sort through hundreds of recipes to find a good one. It contains a handful of gems that will soon become your new favorites. Includes linked table of contents so readers can click on a recipe title and jump right to it!